Your integral silencer has been test fired with handloaded 300 grain subsonic ammunition when it is shipped from our shop to insure that there are not any alignment, or accuracy issues. These silencers are designed to provide a lifetime of use and the only maintenance required on the silencer is to clean the baffles and the rear expansion chamber around the barrel after each use. We recommend simple green as an appropriate cleaner to remove the residue and fouling created from use. 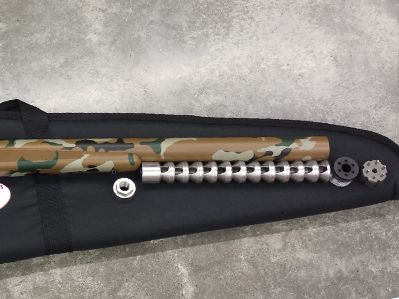 Clean the barrel, shroud and monocore baffle assembly with an appropriate cleaner such as Simple Green. Remove the end cap with a takedown tool that was provided. Remove the baffles with a 90 degree pick or a hook. Remove the barrel stabilizer with a 13\16 socket and an extension on a standard ratchet. Pull the barrel stabilizer straight out of the tube. Rifle the tube is pinned and welded to the receiver. Clean your baffles with simple green. Assemble in the reverse order. TBA Suppressors will not be responsible for baffle strikes as a result of incorrect threading, modifications, improper ammunition, mishandling or misuse. These weapons are not designed to silence full power factory loads. If you do not understand these instructions please contact us immediately for further clarification. Your suppressor will have the best sound reduction quality when used hand loaded subsonic ammunition or 38 Special factory loads. Please contact us for hand loading specs.